Sara Vela, owner of Vela Farms in Victoria, is awarded an honorary belt buckle on Friday at the University of Houston-Victoria by representatives from H-E-B’s corporate office for reaching $1 million in sales in H-E-B grocery stores. Vela has worked with the UHV Small Business Development Center throughout the process of starting and expanding her business. Her products, including jams and jellies, have been sold in H-E-B stores since 2015. Pictured from left are Joe Farias, Victoria H-E-B Plus! store leader; Gary Chumchal, Victoria H-E-B Plus! 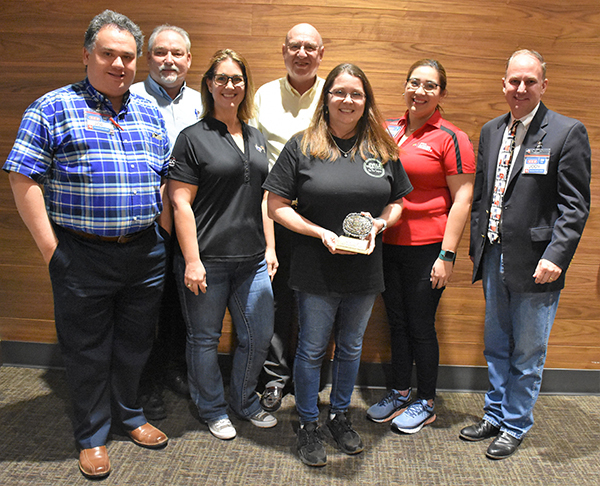 produce manager; UHV SBDC Director Lindsay Young; Donald Jirkovsky, UHV SBDC business advisor; Vela; Tessa Benavides, H-E-B specialist in diversity and inclusion and supplier diversity; and Jody Hall, H-E-B vice president of sourcing.